Australians with Type 2 diabetes are invited to trial a new digital health program to help them stay on top of their condition. The University of Melbourne’s My Diabetes Coach program aims to simplify the management of diabetes and to reduce the risk of developing serious complications. Diabetes is the fastest growing chronic condition in Australia, with one person being diagnosed every five minutes. Type 2 diabetes accounts for 85 per cent of all cases. Professor Brian Oldenburg, from the University of Melbourne’s School of Population and Global Health, is leading the My Diabetes Coach program. “For our trial, people with diabetes are invited to access My Diabetes Coach from their smart phones, tablets or PCs. We will monitor how effective this is for them to self-manage their condition,” Professor Oldenburg said. 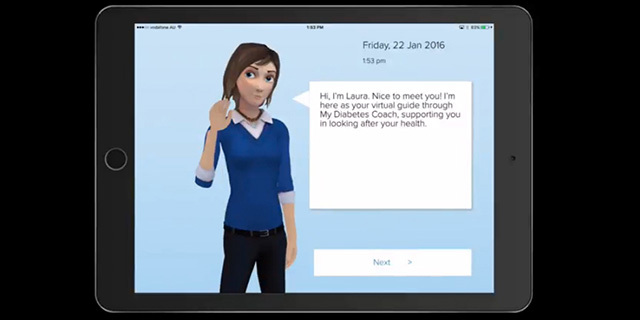 Central to this world first digital health program is an app with a virtual coach called ‘Laura’, who checks in with users weekly to discuss their blood glucose monitoring, medications, exercise, diet and foot care. She will also help people set goals and track their progress over a 12-month period. Eligible participants also get access to educational materials, health monitoring and ongoing program support, both online and from the program coordinator. Study participant Graham Tongs, of Parkville, was diagnosed with Type 2 Diabetes in 2000. He says the program has helped him to manage his condition. “This program is incredible. You set up weekly appointments with Laura and she talks to you about your health as a diabetic and what any issues might be. I’m currently working on logging my exercise. “When you’re first diagnosed with diabetes, you have to digest all this information about the things you need to do to manage it so it doesn’t get worse. The trial is for people with Type 2 diabetes who are over 18 years of age and registered with the National Diabetes Service Scheme in the last six months. The evaluation of the My Diabetes Coach program is funded by a National Health and Medical Research Council (NHMRC) partnership grant and is being conducted in partnership with Diabetes Australia and Diabetes Victoria, Diabetes WA and Diabetes Queensland as well as Roche Diagnostics. The Bupa Health Foundation and technology company Clevertar have also been involved in developing the My Diabetes Coach Program.